ATLANTA— Chipper Jones slammed his 20th home run of the season off Charlie Manning of the Washington Nationals in the seventh inning of a 9-8 loss on Saturday night. With that home run, Chipper Jones joined former Braves third baseman Eddie Matthews as the only two players in major league history with 20 homer runs in each of their first 14 seasons. A tremendous accomplishment and yet another milestone achievement on the road to the Hall of Fame! I am an enormous fan of Chipper Jones, having watched him since I was kid in Greenville, South Carolina. So many in Atlanta have disparaged the Braves for keeping Chipper Jones over the last several seasons because of his incredible propensity towards injury. But Chipper has performed admirably, despite his injuries, and he remains the heart and soul of the Braves. They have been very wise to keep him. He has also accomplished several tremendous feats during his career that I am convinced already make him a Hall of Famer. The traditional threshholds for a hitter to be a sure-fire Hall of Famer include 3,000 hits or 500 home runs. Chipper Jones will likely have to play another 5 seasons at his current pace to reach these threshholds. He currently stands at 406 homerruns and 2,257 hits. He may remain healthy enough to get there, but it will be difficult. Nonetheless, I don’t believe he has to. A lifetime .310 batting average, second all-time among switch-hitters and first all time among power switch-hitters (300 or more home runs). Eight consecutive seasons of 100 RBI’s (during his second through his ninth season). Ten 100 RBI seasons overall. National League MVP in 1998 and a six-time All Star. Fourteen consecutive seasons with at least 20 homeruns. He is chasing a batting title this year (.359), after having come very close to one last year (.337). Further, those are his two best hitting seasons, after already having amassed 8 seasons of hitting over .300 prior to 2007. Perhaps his most unusual (and incredible) single season feat was in 2006, when he tied Paul Waner’s 79-year-old record for consecutive games with an extra base hit- a whopping fourteen consecutive games. He was a first overall draft pick by Atlanta in 1990. He has been one of the premier players in the game since 1995, when he nearly won Rookie of the Year honors in the National League. He has had only one season that might be considered a down season (2004, .248, 29, 96). And that season was mainly due to a first half slump- he had an amazing second half. 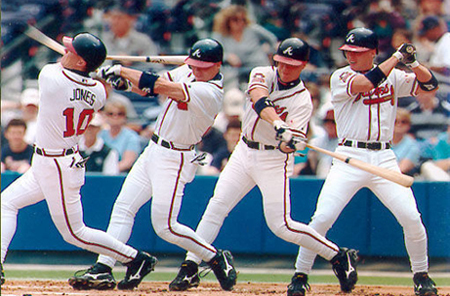 In short, Chipper Jones is a Hall of Famer in my book. Congratulations on the achievement last night, Chipper! We look forward to many more! National Conventions or National Pastime? What an interesting stat, 14 consecutive years with 20 HR plus. That he shares that record with the very underrated Eddie Matthews is also very interesting. I’ve always been a fan of Chipper J. myself, good work. Massasoit: I think it’s pretty cool that the two men that hold this record are both Braves third basemen. I wish Chipper were more consistantly healthy lately, but he’s still a force when on the field. And he seems to be becoming a better hitter with time. Really quite impressive.